We welcome Pierre and Monique Seillan from Verité Wines today. Tom Simoneau, Dan Berger and Barry Herbst are all in today with Steve Jaxon. 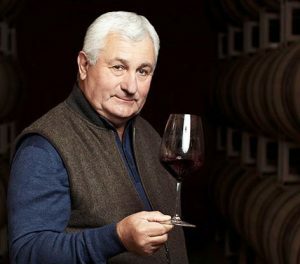 Pierre is a Vigneron, a winemaker and vineyard master. Tom has watched him take great care with his vines, separating the clusters by hand to get them perfect sun exposure. Pierre and Monique met Barbara and Jess Jackson 25 years ago in Bordeaux. Pierre makes wine in France, Italy and Sonoma County. He is a 9th generation winemaker. One of his ancestors in 1879 brought American rootstocks to France to rescue the vineyards. Today’s big news in the wine business is that Gallo is paying 1.7 billion dollars for 30 brands from Constellation, including Clos di Bois. Dan Berger says that the news is not unexpected. Constellation had spread itself thin in marketing and could stand to pare down. Gallo has very sophisticated marketing and they will do well. The wines that are in that purchase will be happy to be working with Gallo, says Tom. Dan agrees they are one of the best companies in the world at marketing wine ever since the old days when Julio Gallo made the wine and Ernest Gallo did the marketing. The Arcanum Super Tuscan is from their property Tenuta di Arceno in Tuscany. 2019 will be the 53rd harvest in Pierre’s career. Monique says that 22 years ago when they came here, they didn’t know what would happen. Both of their children work in the winery now. First they taste the Sauvignon Blanc, a 2016. Dan finds it has a stony character with a bit of acidic lemon peel. He thinks it is too young still. Like the great white wine of Bordeaux, these whites can age 20 or 30 years. They have not yet made a label for this wine. There are only about 600 cases of this wine. They sell it at their tasting room. Pierre tells how Jess Jackson came up with the name Vérité, for a special wine he was planning to make. It means “the truth” in French. For Jess, his philosophy was to make wine “without compromise” with dominance of terroir and the signature style of the vigneron. When Jess invited Pierre and Barbara in 1996, they put this into practice. 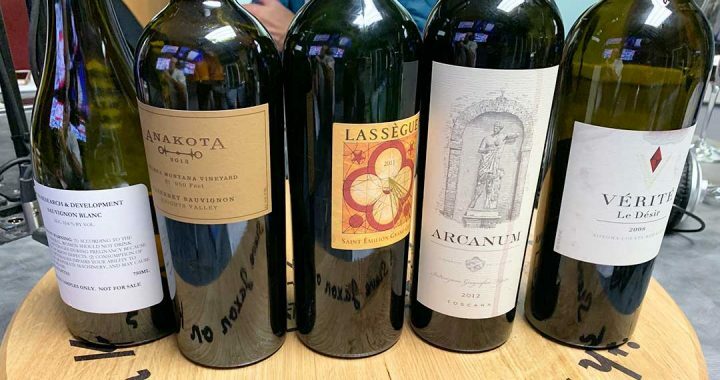 The next tasting is the Super-Tuscan, Arcanum, which comes from a property Tenuta di Arceno in Tuscany, that the Jackson family owns. Pierre says that the topography of this Tuscan winery is similar to that of Sonoma County. It’s a Super-Tuscan, 65% Cabernet Franc. It’s a 2012. Tom Simoneau describes it as medium-bodied and elegant, as a Cabernet Franc can be. Dan says that it has great acidity and needs more time in the bottle. It has the Cabernet Franc aromatics of iron filings and green and black olives. These are the savory flavors of the Bordeaux family. Instead of explosive fruit, it has savory fruit. You can get it at their tasting room in Healdsburg. They taste the 2011 St. Emillion Chateau Lassègue. Tom says that it sells for $60 but could be twice that, easily. They all agree that Cabernet Franc is great alone or in a blend. Compared to Cabernet Sauvignon, Cabernet Franc is lighter, more violet and its body is not as tannic. It’s spicy and is a wine “singing in the glass” as Pierre says. Then they taste the Anakota which is 100% Cabernet Sauvignon. They planted the vineyard in 1996 and 1997. They are at about 900 feet of elevation, facing south west, on a gentle slope. He considers it one of the best places in the world to grow Cabernet Sauvignon. It sells for $120. The next one tasted is a Vérité that sells for $420. Monique tells how they started the Vérité program 22 years ago. The year after they started with the Italian vineyard, they were looking for a Bordeaux winery. They found Chateau Lassègue, which has an excellent sun exposure. On the label there is a picture of the sun dial from the side of the chateau. Even if it is 11 years old it is worth it to decant it. Dan says there is more to come in this wine and that’s one way to get it.